The Zurich Chess Challenge 2013 was officially opened in Switzerland. The four competitors – Viswanathan Anand, Boris Gelfand, Fabiano Caruana, and Vladimir Kramnik, played a double round robin blitz opener. Right from the start Kramnik and Caruana showed their intentions to fight for the top positions at the Zurich blitz opener. 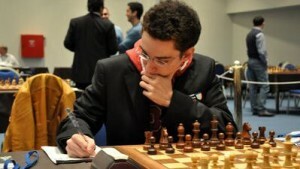 Kramnik defeated Gelfand and Anand with white, while Caruana did the same with the black pieces. After ten games were played, Kramnik and Caruana were equal on top with 4,0/5 points, while Anand and Gelfand were trailing with 1,0/5 each. It all came to a showdown, where in an exchange sac show Caruana won against Kramnik with black to take the blitz title. Anand and Gelfand also split the point in their direct game to finish shared third with 1,5/6. Tomorrow is the first round of the classical Zurich Chess 2013. Follow the games live on Chessdom.